The main aim for the Spirit Motor Group backed Balfe Motorsport team for round three at Oschersleben was to be closer to the rest of the FIA GT1 field over the course of the weekend, with the hope to be able to get into the points. With the team’s first FIA GT point now on the board – it didn’t score any last year in the G2 class, even though it reached the podium more times than some of the other cars on the grid – it was partly mission accomplished, at least for now. A lot more work had been undertaken by the team in the break before Germany and the hope was that it wouldn’t be the last car in the GT1 class on the timing screens. With ten cars out in Germany it was great for the Balfe guys to see the Saleen S7R in P8, in front of the Race Alliance Aston Martin and the B-Racing Lamborghini, at the end of the opening free practice session. In the second session the team hit a small glitch, when the car began to shut down as Shaun Balfe tried to make his way down the pit-lane. A number of attempts later it was found that the ‘cool box’ for the drivers’ cool suits has leaked a small amount of water into the footwell of the car, which in turn had found its way into the electronics. Once found the problem was easily solved, but it lost the team a little bit of track time and it subsequently ended the session in 10th, just two-hundredths of a second behind the Race Alliance Aston. So, qualifying would show exactly where the team actually lies in terms of outright pace and whether the hard work had paid off. The twenty minute session in the FIA GT championship isn’t very long. It’s a ‘get out, get it done’ kind of session. Shaun Balfe went out and set a couple of laps and knew there was a bit more in the car to come, not to mention that he’d have been able to set a faster time if it hadn’t been for one of the Aston Martins backing up the cars behind for an attempt at a fast lap! So, it was decided that he should pit, swap tyres and make adjustments and go for another lap. However, as he got to the end of the pit-lane he was called in to the scrutineering bay, which lost the team around three minutes. A large chunk of time when there’s only eight minutes of the session left to go! Shaun went back out but was unable to get a clear lap in the time that was left and the team would once again have to settle for 10th place on the gird. 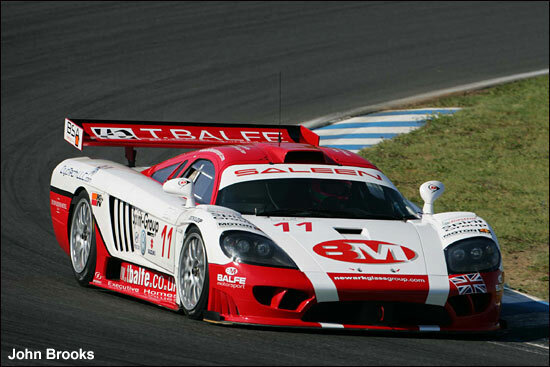 But the good news was that the Balfe Saleen was now knocking on the door of the other teams. It was only half a second from the Lamborghini in front, whereas it had been three seconds away at Brno. Added to the fact that they were around three seconds away from the pole time from the Maserati MC12, exactly where they predicted the car would be at the start of the season. The team is now where it should have been at the start of the year. Unfortunately, until you go racing, especially at this level, you never know the true outright pace unless teams have to push. It was a slight boost for the guys in the team that the car was doing what it was supposed to and both drivers were a lot happier with how the cars was on track. All the team believed that they had a good race pace and that the three hours on Sunday afternoon would give them a chance to prove what they could do. A reliable and trouble-free run would be a good aim. At the start of the race Shaun expected there to be some contact at the head of the field, because the Oschersleben circuit is pretty tight over the opening few corners and the front runners would be desperate to get out and into the distance early. The early laps looked good for the Saleen, with Shaun staying with the Lamborghini and Aston Martin ahead for a number of laps, before they began to very slowly pull out a small gap. Everything in the Balfe car was fine, although Shaun noticed that the water temperature on the dash was running reasonably high, but thought it was just because the outside temperature was hot. Jamie took over and immediately radioed to the team that the temperature was high – now at 94 degrees, nothing to be alarmed about, but certainly something to watch. Jamie put in a superb stint behind the wheel. He was lapping consistently, and with the temperature issue, was constantly giving the team feedback on what was happening in the car, especially as the temperature was steadily rising. With about 15 minutes of Jamie’s stint left to run he advised the team that the water had now peaked at 99 degrees: there was obviously a reason, but the temperature had been rising very slowly so it wasn’t thought to be a mechanical problem. As he dived into the pits to hand back over to Shaun the team set about checking all the vents across the front of the car. Sure enough, there was a large amount of rubber and debris from around the track that had been sucked into the gaping mouth of the Saleen. As he went back out onto the track, Shaun advised the team that the engine was now running at normal running temperature. Relief for the team but it was something that could have proved terminal if it had happened more quickly. As the laps clicked down the B-Racing Lamborghini also struck trouble when Christophe Bouchut found he had no brakes at the end of the start/finish straight, putting the car into a spin and into the gravel – and barriers – and out of the race. This put the Balfe car into eighth place, good enough for its first point in the series and gave the team something to celebrate, after two rounds that had been frustrating and demoralizing. The team is now looking forward to the remainder of the season and knows that it can progress further up the order on the grid. There is more to do on the car and the drivers are now able to push themselves harder to get the times. 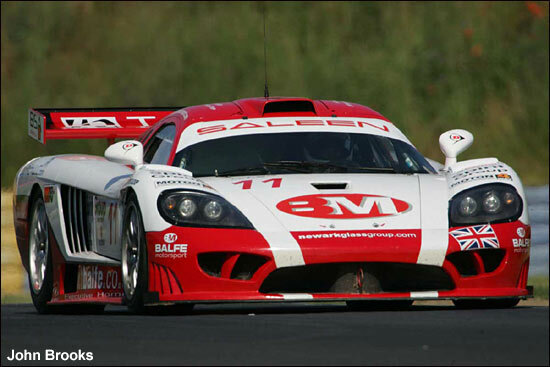 It will only be a matter of time before the red and white Saleen is mixing it with the rest of the GT1 runners. “It’s great to have scored a point,” said Shaun Balfe. “People will probably think that to shout about eighth place is a little bit premature, but we’re where we expected to be at the start of the year and we know that there is a lot more to come in terms of pace, from us and the car.